One Directions’ Harry Styles broke down in tears as band took to the stage without Zayn Malik. On Wednesday, March 25, when the news of Zayn Malik’s decision to quit the band was still breaking around the world, One Direction was performing in Indonesia. 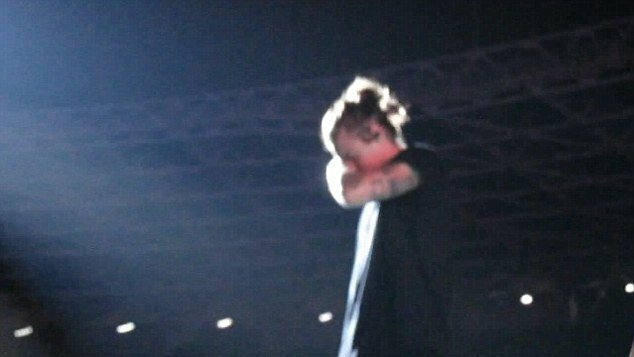 Harry Styles walked around on stage, head in hands as he started to cry. A statement released by Zayn Malik on March 25 said “it’s time for me to leave”. It began: “My life with One Direction has been more than I could ever have imagined. “But, after five years, I feel like it is now the right time for me to leave the band. I’d like to apologize to the fans if I’ve let anyone down, but I have to do what feels right in my heart. The footage of Harry Styles was taken as One Direction performed on stage in Indonesia’s capital Jakarta, the latest stop on their On The Road Again Tour. Last week it was announced Zayn Malik had been signed off from the current tour with “stress”. It is unclear from the footage whether Harry Styles, 21, was crying because of the news of Zayn Malik or because fans were showing support by shouting his name. At one point in the concert Liam Payne reportedly comforted him. In a black T-shirt and with his hair up in his trademark man bun, Harry Styles wandered around the stage with his head in his hands and wiping away tears. Louis Tomlinson has also tweeted: “Your support has been incredible, truly incredible so thank you so much! Niall Horan was the last to tweet. He said: “Been a mad few days and your support has been incredible as per usual! This in turn Spurs us on to make the best music we possibly can. “Put on great shows / tours for you guys. You are the best fans in the world and you deserve nothing less from us! It’s not the first time Harry Styles has appeared to cry on stage. Footage showed him snivelling at a gig in Melbourne, Australia, in 2013 while singing Over Again. One Direction released a statement on March 25 confirming to fans that the band would continue as a four-piece. They will record their fifth album in Zayn Malik’s absence and will continue with the remaining dates on the band’s world tour.